Sometimes when things are feeling bleak, and it smells like the world is burning down around you, it’s nice to escape into something light, fun, and maybe a little mindless. While cat videos are always an option, you can feel more sophisticated (and support the local arts scene) by going out and seeing a musical. That’s what we did last weekend when went out for drama talk and drinks and the opening of Ain’t Misbehavin’ the latest production of 42nd Street Moon. Brittany: What a fun classic American musical. Katie: Those actors were incredible! They all had amazing voices and such stage presence. I just wish they used microphones. The band was great, but there were moments I couldn’t hear the singers, and that was distracting. B: 42nd Street Moon is trying to do things the old-school way, so they aren’t using microphones on purpose, but that was probably my biggest complaint too. I like what the company is trying to do though, honest rivals of these classic shows. I think it was very successful in that. K: I totally agree, the costumes, the staging, and the choreography all felt very authentic. I feel like this show would be more fun in a different space though. This is a much more traditional theater atmosphere, but this felt like more of a cabaret show. It was a little long to just sit and watch with no plot or story. I think more of a cabaret atmosphere would have suited the show better. I still enjoyed it though, especially some of the songs in the second act. B: This show is hard for a modern audience, because you are just sitting and watching a series of song and dance numbers. Really well done song and dance numbers, but that’s it. I guess we’re just spoiled with shows like Speakeasy, where there’s a cabaret going on, but you can also walk around, have drinks, play casino games, and then come back to hear more song and dance. K: Overall, I think it was a well done production. I liked the set, the lighting, and costumes. I felt like I was watching a show in the 1930’s. It felt very lively, moody and cool. The Verdict: If you love jazzy music from the 1920s and 30s, this is the perfect show for you. 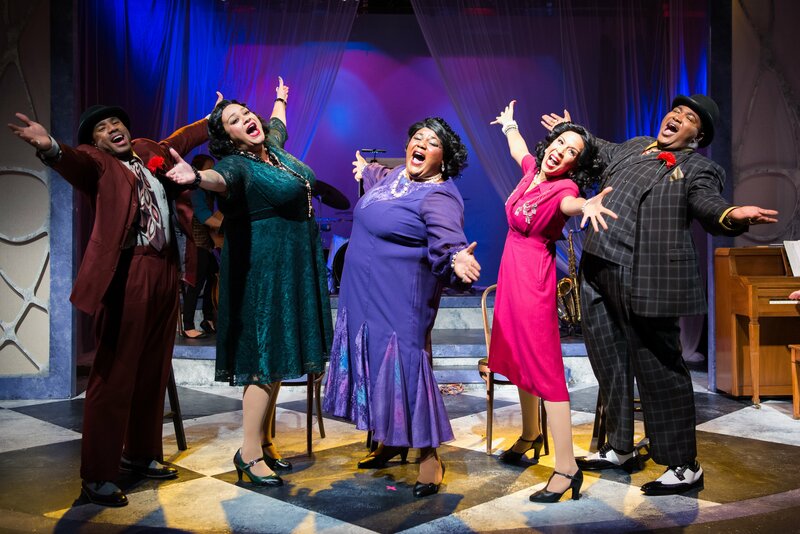 The Drama Talk: They don’t really make shows like Ain’t Misbehavin’ any more. This musical revue was created as a tribute to the black musicians of the 1920s and 1930s who were part of the Harlem Renaissance. If you like jazzy, swing music, you’ll probably really enjoy this show. The second act had some of our favorite moments of the show, including a dope song and dance about a five foot joint “The Viper’s Drag” and a beautiful rendition of “Black and Blue”. Like many things that were written a while ago, there were some cringe-worthy moments of sexism, as well as some awkward-to-watch bits of pandering to racist stereotypes. However, overall, 42nd Street Moon creates an engaging, enjoyable and authentic revival of this classic show. The Drinks: Saturday shows are at 6pm so we ended up getting dinner and drinks after the show a couple blocks away on Columbus Avenue at Doc Ricketts. If you want to see a show after the show, check out Doc’s Lab, which is the venue underneath Doc Ricketts. Ain’t Misbehavin’ runs through October 29th at the Gateway Theatre. Tickets range from $30-$75 and are available on their website. Right now there are tickets available on Goldstar for $22.50-$25. Drama Talk & Drinks: The Mineola Twins - "Ridiculously relevant"